Can I just say that I love giving baby knits? 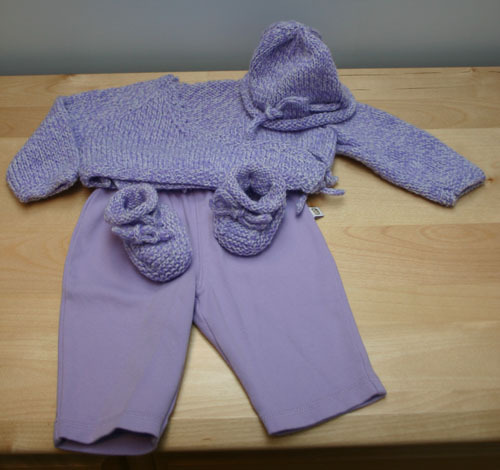 The sweater and the booties were a big hit, and R. (Jason's sister and the baby's mother) already had a pair of lilac pants that matched! A few hours later she happened to mention that she was a little short on tiny knit caps for the baby's first few weeks. Say no more! Over the next day and a half, I knit up a little cap to match. One of Jason's cousins (hi Peter!) was also in town, and he snapped a picture of the whole get-up. He's got a great eye and a fantastic camera. Check out the the detail on the booties and hat from the picture when you enlarge it to 100%! Yeah baby ensemble! I love the I-cord detail on the hat. That's one special little baby. She will certainly be loved (and well dressed!). Wow, you have some fantastic projects going on! Did you have a pattern for the baby booties, or did you make them up? I would love to try making a pair! Anne-Caroline, the booties are from the Knitting for Babies book -- the pattern is called "Stay-On Baby Bootie". Good luck! Wow, that set is ADORABLE. And I'm so with you, I love baby knits. I'm always looking around for babies I can knit for. Is that yarn you used Classic Elite Flash? I used it last summer for a few baby knits, and it was wonderful! Thanks for the Spanish help! If I'd remembered you were here, I would have asked you. There are just SO MANY BLOGS it's almost a full-time job keeping up! Great Photo....but alas, where are the pics of you and hubby to be? !